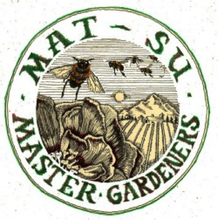 The Mat-Su Master Gardeners Association meets on the first Monday of the month at 7:00pm. During the winter months we meet in the MTA building in Palmer. During the summer, we have the meetings in various members’ gardens. We have short business meetings including door prizes followed by guest speakers and in the summer, garden tours. Activities in the past have included a tour of an apple orchard with a demonstration on how to press your own apples, lectures on composting and other gardening topics, tours of the Plant Materials Center, potlucks with recipe exchanges, and Christmas parties with Chinese auctions. The club sponsors an annual plant sale and is involved with various community service projects. Below is the link to the membership application form, which should be printed and filled out. Please bring the completed form to one of the gardening club meetings, or mail it to the address listed on the form. This is necessary contact information and a guide to programming and discussions! Thanks. ​You must sign up no later than January 15, 2019 if you wish to be listed in the 2019 Membership directory.